The offering time is often one of the most overlooked parts of the church service. Many pastors feel awkward about that time or go into autopilot as they rush to get through it. Yet, the offering time should be an occasion to worship God joyfully through generosity and gratitude. Below are some practical steps you can take to revitalize your church’s giving time. **Be clear about where the money will go. **Tell members which specific ministry or person their money will help, and share a story of how offerings have made a difference at your church. If you have the capability, show a picture or short video of how their money will make an impact. **Don’t view the offering as an interruption, but an act of worship. **Provide a way for all members to participate in the offering, even if they give online. FaithStreet provides “I give online” cards that your members can place in the offering plate as a symbol of their financial commitment to the church. It also gives members time to reflect on what they are giving to God. **Remind your congregation of the theology behind the offering. **Many think their offering is simply monetary. However, the offering is a space to remind your members that they are actually offering their lives to God. Romans 12:1 states, “Therefore, I urge you, brothers and sisters, in view of God’s mercy, to offer your bodies as a living sacrifice, holy and pleasing to God – this is your true and proper worship.” Money is one outward sign of the inward spiritual state. Mix up your approach to offering time. Don’t feel the need to stick to the same format every week. One week you could share a Bible verse on giving, and the next week you could invite a ministry leader to share how money has helped him or her serve effectively. **Give clear directions on how to give. **If you are still in the early stages of online giving, allow a member who has recently switched to talk about how online giving has changed the way he or she gives. Remind members that they can set up recurring gifts online. Provide giving cards, the QR code, and a link so that members can give online during the service. Tell members that online giving is your church’s preferred method, and thank those who already give online! **Be open and honest. 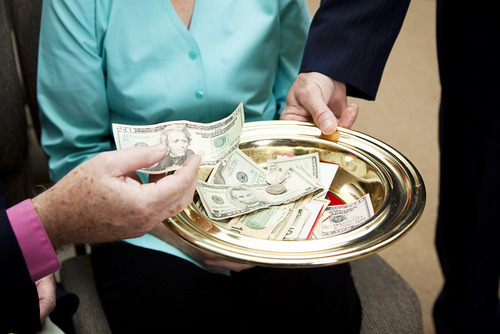 **People will feel more comfortable giving if they know how your church budgets the money. Hold an annual budget meeting open to all members so they can review exact figures and see how their money has been and will be used. **Be brief. **The offering is not a time to give a second sermon. Rather, it’s a space to take a few moments to discuss money with your church. Mark Brooks, founder of The Charis Group, advises giving an offering “elevator pitch” – a few sentences that encourage members to give.